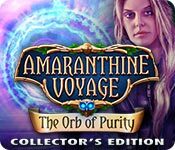 Amaranthine Voyage: The Orb of Purity Collector's Edition is rated 3.1 out of 5 by 36. Rated 5 out of 5 by Majestyx12 from Architectural Beauty I had fun with this game. The buildings are beautiful. The music is fitting for other worlds but can't listen to it for hours. My favorite hidden objects were the crystal cut items such as flowers, butterflies and bows. 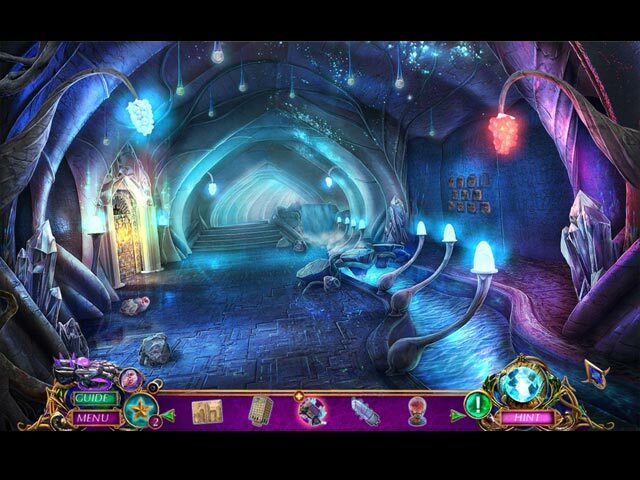 I liked collection the owls and I liked the hidden objects. The puzzles I liked are the lock parts and matching the symbols. The souvenir room is fun for revisiting the scenes as is the Video replay. Skipped lots of puzzles because I didn't like fooling with them. Rated 5 out of 5 by tutortime from Excellent Series ! 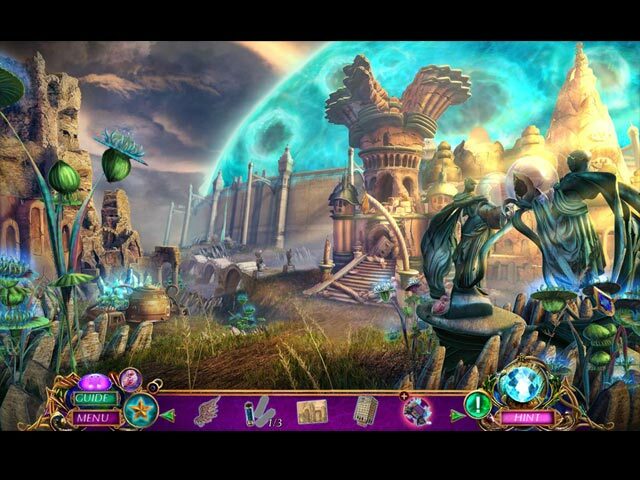 Great game; storyline, graphics and mini games. You need to find an owl in each scene and more in the bonus chapter. Also, there is a souvenir room of 43 items to find. Several games do this now and I am not sure what the game play is in this. They are just odd items in the scene - like a slingshot in the middle of a cave scene. It may be more fun to find them while you play the game. Rated 5 out of 5 by juinrenee from So much fun This was the last of the Amaranthine Voyage series. It was the best of them all and they were all good. This was challenging and I played at expert level. Rated 5 out of 5 by ktimmo01 from Fantastic Game! Based on some of the earlier reviews, I thought this might be another Surface: Reel Life, but I loved it. As usual, we save the world, in this case 2 worlds, by the end of the story. I loved the graphics and the storyline as well. I played casual, and the challenge level was fine for me - I play games to relax after work. I even loved the bonus game. It followed the story logically and was just as well done. I absolutely recommend this game. Rated 5 out of 5 by braillecode4 from Amaranthine Voyage: The Orb of Purity I almost did not buy this game. Anything that is less than 4 stars I don't bother. So I read the reviews and watched the video. Decided to buy and try anyway. I don't know why this game is getting bad reviews as I really liked this game. It has everything! Even some of the puzzles I couldn't get and had to skip. Hard enough that I used the Hint button more than once. Story was good, music, graphics, teleport, locking inventory, collectibles. First time I found all 43! Give this game a try, you won't be disappointed. Rated 5 out of 5 by LadyAuburn2000 from Awesome game from an awesome series! A must buy for anyone!! Love the variation of the HOS and entertaining story line. It is definitely a game I will play again. Love hunting for the Owls.. I own all the games of this series in CE! Love the extras. This is one that you will truly enjoy and play time and again. Rated 5 out of 5 by pennmom36 from A Fine Line Of Balance What was once whole, now is split in half, balance has been disrupted with mankind's discovery of Harmonium. You cannot have light without the dark, there cannot be good if there isn't evil, you cannot destroy until you create! Dr. Bennett has made a major breakthrough with her otherworldly portal, and someone has just arrived on her doorstep! Kraixx might look like you and I but he's definitely from another world, a world being consumed by the dark energy of Harmonium. If balance isn't restored in his world, our world will surely perish! Fortunately, Kraixx has equipped you with a Gauntlet capable of collecting both dark and light Harmonium energy, breaking barriers and discharging it's energy as needed. (whew that comes in handy) There are 43 Hidden Collectible Owls or Freyy's Apprentice, there is no cursor change to help you out, but they seem to all be pink which seems a bit odd. As with all CE's there are several Achievements to earn, and many of the inventory items have plus signs indicating some type of interaction is necessary before using the item. The Hidden Object Scenes are typical for this series, and many of the scenes have slight movement in the scene or entirely different locations as the camera pans to a different area. 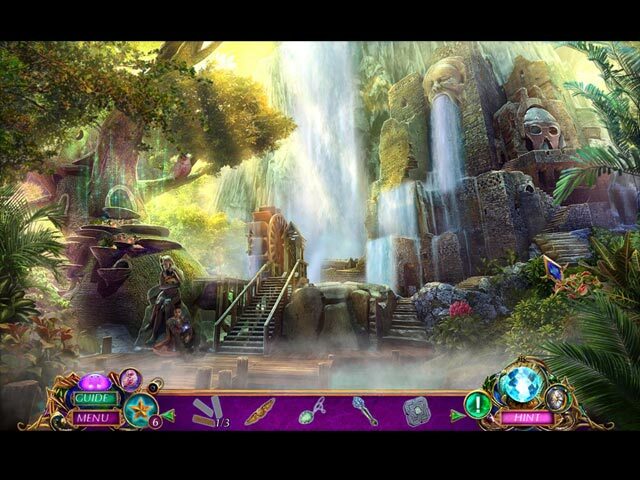 Most of the Hidden Object Puzzles are silhouetted shape finds, or multiple finds, but there's also an extremely interactive and progressive scene where you fidget with all kinds of gadgets, and another where you are tasked with finding symbols or glyphs written on the walls on 3 sections, which was somewhat challenging and a nice change of pace. You can opt for an alternate Bubble Shoot game if you're not into HOP's. The Mini Games are fantastic! Every time you use the Gauntlet you will play a small mini game of either matching the identical symbols or drag ropes across every star point. 1) Assemble the CCPP logo by dragging different tetris shapes into the individual letters. 2) Swapping or Rotating molecules until they are in the correct outlined shape slots. 3) Use arrows to adjust the frequency of radio soundwaves. 4) A series of mini games within one puzzle (super fun) the first step is to swap tokens to the correct slot, then use arrows to move color coded balls to their matching slots, followed by choosing several shapes that will recreate the image shown, and swapping the blue and purple tokens to the right and left. 5) Match identical owls until only one remains. 6) Slide different color coded suns to their matching slots on a star shaped track. This Collector's Edition has 12 Achievements, 18 replayable Puzzles, 15 replayable HOP's, replayable Bubble Shoot Games, 13 Videos, a Souvenir Room, 43 Collectible Owls, 5 Music Tracks, 8 Concept Art pictures, 8 Wallpapers, a built in Strategy Guide and a Bonus Adventure Chapter, enjoy! Rated 5 out of 5 by biscuitsmama from MEET KRAIXX IN THIS GREAT NEW AMARANTHINE VOYAGE As we begin the game we see that our old friend Professor Bennett from the last Amaranthine Voyage is back and you, playing the game as Eve Glover, are once again working with the CCPP. As the leading expert in the field of Harmonium, your help has been requested as a visitor from another has shown up on the professor’s “doorstep”. Kraixx has crossed through a portal to seek our help to save his world from doom caused by dark Harmonium energy that has gone awry. Unfortunately, it appears that our visitor has brought an unwelcome dark energy with him so now Earth is in the same boat. Follow Kraixx back to his world and help him overturn the Watchers and restore the balance in this new game in the Amaranthine Voyage series - The Orb of Purity. There are six chapters to the main game plus the bonus game. You can select from a choice of four modes of gameplay: Easy, Medium, Hard, and Custom. If you choose the custom mode you can set the hint recharge time in a range from 10 to 120 seconds and puzzle skips from 10 to 400 seconds. There are other settings you can fiddle with and most importantly, at least IMHO, is that you can turn of the click penalty. Of course with this being a game from my favorite game developer, I know that I am getting top quality in graphics and sound. Not to mention excellent gameplay! After formulating a cure for Kriaxx we receive a special gauntlet from him that will absorb both light and dark energy but, of course, we must play a mini-game in order to charge the gauntlet prior to use so it is basically another time filling gimmick. If I like the mini-games I am not as bored by these gimmicks but in some games they are rather a nuisance to complete when I need to get on with saving someone or something – lol. We also have an interactive transporter type map that is located on the right side of the user interface area. The HOPs include a variety of types with some requiring that we find so many of a certain item where others are the type where we find items based on silhouette. There is also my favorite list type included in the mix but no matter the type of scene many are quite interactive and that increases the fun. The puzzles include rotating items to a specific location, matching of rune figures, and there is at least one super puzzle during the game’s demo that can be a bit tricky. I love these multi-faceted puzzles that require a bit more thought to solve. All in all, the HOPs and puzzles are terrific and even though some of the puzzles might seem easy, there is a good mix of difficulty so there is something for everyone. During the game you can earn twelve achievements and find 43 collectible owls. Other extras include HOPs and new HOPs, and a souvenir room where you will revisit scenes to find certain items. You can also replay the mini-puzzles which is fun if you skipped any during the game. There are the other fairly standard extras such as pictures, videos, music, strategy guide and the bonus game. The Amaranthine Voyage series includes some of my favorite games although I wasn’t too thrilled with the last game in the series, so fortunately The Orb of Purity seems to be a much more stimulating and entertaining game. I love any game has a sci-fi theme and this one is right up my alley more so than the recent Amaranthine Voyage games. The storyline is quite good and I really want to help Kraixx put his world in order. Of course I am really not too sure who the bad guys are here but it won’t be long before I figure it all out and in the meanwhile I have an entertaining day ahead as I delve into The Orb of Purity. Needless to say the game was an instant purchase for me but, as always, I recommend that you try the demo to see if this is a game you will enjoy.